Writer’s Digest is the long-established and well-respected writers’ magazine which dominates the American market. Established in 1920, it’s really the grand-daddy of all writers' magazines and is linked in to a writers’ book club bearing the same name, writers’ courses and an extensive publishing programme of writers’ books. Owned by F & W Publications, its headquarters is in Cincinnati, Ohio, giving it a distinctly non-New York perspective on the writing and publishing world. 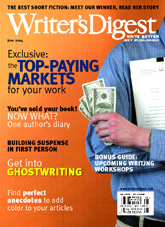 Writer’s Digest is focused on helping writers to improve their work, research markets and get published, although in more recent years there has also been more emphasis on showing you how to publish your own book, as American writers turn increasingly to self-help. The focus on writing means articles on subjects such as finding the right hook for your article; ‘acting out’ by keeping your audience hooked if you’re writing a TV script; planning your projects; grammar rules which should not be broken; stretching the tension and revealing what’s on your characters’ minds when producing fiction; and how to give personal experiences a universal meaning when you’re writing a life story. There’s also a great deal of advice on getting published, including articles on getting to an editor without having an agent; how to break into travel writing; 30 hot markets for your short stories; how to find an agent; and getting the right title for your book. These pieces are bang up-to-date and offer real practical assistance with getting your work published. In addition to this, Writer’s Digest has a lot to help the self-publishing author, who really needs to know how to price their book, how to publish and how to sell it. A recent article offered advice from self-publishing companies on how to go about it, highlighting the way in which the possibilities for writers have opened out in recent years with the increasing availability of print on demand. Firsthand accounts and advice tend to come from bestselling authors, such as Janet Evanovich, Stephen Coonts and Tess Gerritsen, rather than ‘new author breakthrough’ type of stories, so it’s 'telling it from the top' rather than stories from the trenches. In general it’s fair to say that the magazine is very professionally produced. It has a slightly glossy quality (not in terms of the rather cheap paper it’s printed on!) which lets you know that it comes from a highly successful and profitable stable. There’s also plenty of advertising, much of it related to Writer’s Digest own other businesses, which some may find intrusive but which does give the writer a series of other well- managed alternatives if you’re looking for help from books or courses. Perhaps American writers are more professional in their approach in what after all is a highly developed and lucrative market, the biggest in the English-speaking world. Writers from elsewhere may find that Writer’s Digest’s exclusive focus on the American market makes it less useful for them than a more locally-produced writers’ magazine would be. On the other hand, they may feel that they need to study what the US market wants. For American writers, it looks like a pretty essential read, but for everyone else it’s perhaps a good secondary choice.